Something Different at Myrtle Beach. 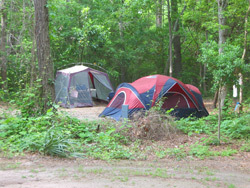 You can enjoy all that Myrtle Beach has to offer and spend your nights camping near the beach. Many folks use the park as their launching pad for visiting many of Myrtle Beach's attractions. Yet you do not have to leave the park at all if your plan is to just enjoy the beach and go swimming in the ocean. The park has close to a mile of Grand Strand beach. You can stay for an afternoon or a week and find time to explore the park's natural habitats, enjoy the sea breeze blowing through your camp while you sleep, or just relax. In addition to the beach and campground, Myrtle Beach State Park also contains miles of hiking trails, a fishing pier, picnic facilities and more. This page provides an overview of the park's amenities and links to pages that have additional, and more in depth, information. You can also use the navigation links found on this and other pages to jump directly to specific information you are looking for. Fees for entering the park are on a per person basis. Children 5 and younger – free! 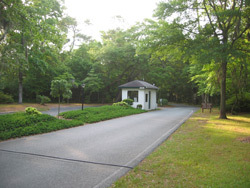 The park is located off of South Kings Highway (Rte 17) near the Myrtle Beach Airport. You should be aware that the park is located off of one end of the runway, which means there is a lot of low flying airplane traffic throughout the day. Driving Directions. The campground is large – 350 campsites – but pleasant. It is surrounded by and built within a maritime forest. The towering pines offer plenty of shade. There are tent, RV and large RV campsites. Reservations are recommended for the busy summer season but the park does hold some sites back to be rented on a first-come-first-served basis. There are cabins for rent, which are located in an separate area from the campground, and two apartment style lodging facilities available. 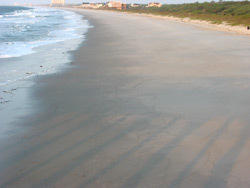 The beach is what you would expect for the Grand Strand – wide and with nice white sand. There is lots of room and there can be less of a crowd here than what that you find in areas where the beach is lined with hotels. A fishing pier splits the park's beachfront in two. On both sides of the pier there are parking areas at the back of the beach dunes. The park also makes it easy to enjoy a day at the beach, with easy to access restrooms and some open air showers at the paths that lead between the dunes and connect the parking areas with the beach. There are a number of trails that wind their way through the park. All of these are easy going, relatively flat hikes. When you combine the parking areas and the beachfront boardwalk, you could easily cover a few miles and see a lot of different parts of the park's features: the beach, some relatively rare maritime forest and even some freshwater ponds. 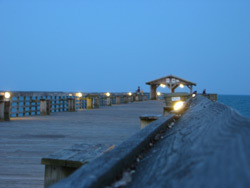 The fishing pier is one of the centerpieces of the park. You need to pay a daily fee ($5 or less, depending on your age) to fish - walking is free - but if you want to get your line in the water, it is a great deal. There are both group facilities, available for rent, and individual grilles with picnic tables. Many of the parks picnic facilities are north of the pier, either along the road coming into the main beach area or in the areas that are behind the beach parking areas. The park offers talks and interactive presentations that discuss a range of topics. Most programs are family oriented so they can be fun for adults too! 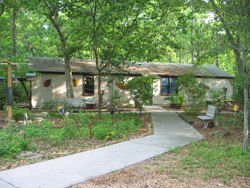 A small nature center, when open, has displays that include live animals and hands on displays. There is an emphasis on local organ sims, especially to stress the importance of the park's habitats. It is typically open from Tuesday through Saturdays. When the center is not open it can be fun to visit the outdoor wildlife habitat display that is in front of the building. 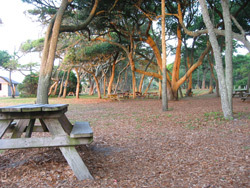 There are two playgrounds in Myrtle Beach State Park. One is located behind the north side beach parking lot. The other is found near the activity center, which is not far from the main park office. The beach is open for horseback riding from the third Saturday in November through the last day of February. In addition to per person park entry fees, each horse is charged $25 for entering the park and must have current Negative Coggins papers. Horses are not allowed to remain in the park overnight. Pets are allowed in the park, with some stipulations. They must be kept on a six foot leash and be under your control at all times. There are also a few places where they are not allowed at all. Pets are allowed in the campgrounds. Dogs that bark excessively or that threatan other guests will not be tolerated. Pets are not allowed in the cabins, the cabin area, or in the apartments. Per a municipal ordinace for all the local beaches: Dogs are not allowed on the beach from May 1 through Labor day during the hours of 8:00 AM until 5:00 PM. This site is not affiliated with the park, park management, or the state of South Carolina. Contact the park if you need further information or assistance.